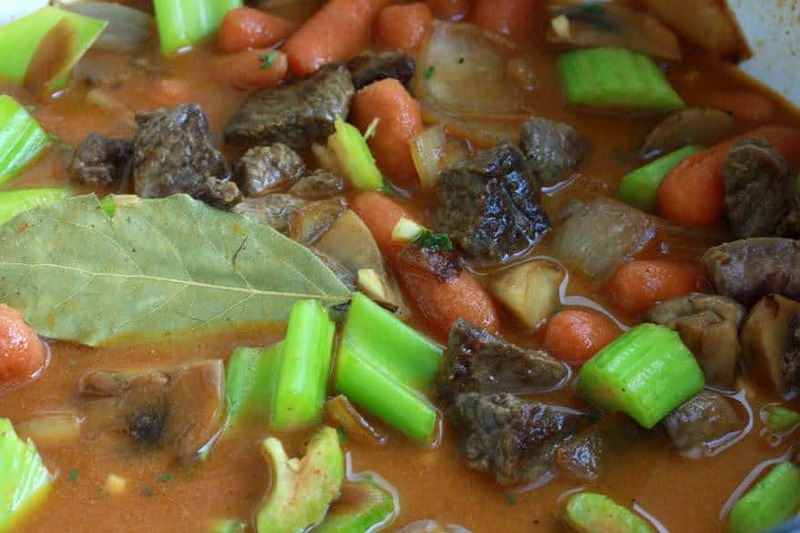 A rich and hearty beef stew. 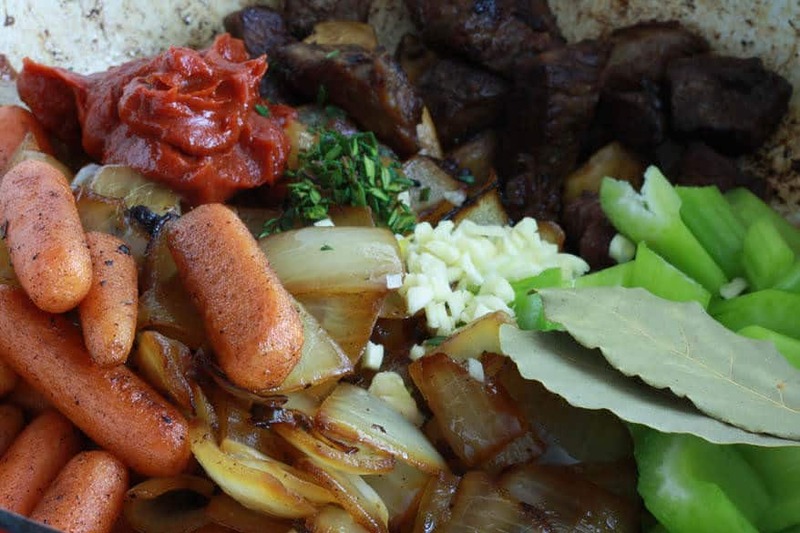 The beef, onions, and carrots are all browned, contributing to a deliciously rich flavor. 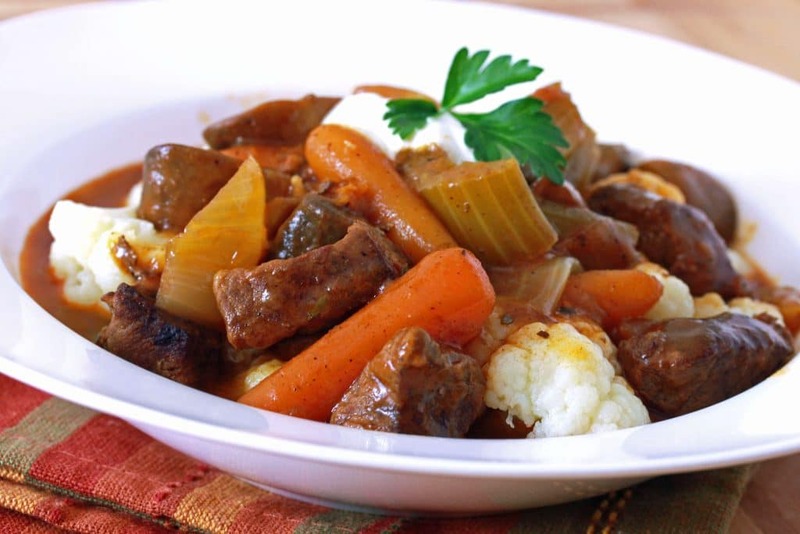 Served over cauliflower instead of potatoes, this stew cuts down on carbs while providing more healthy veggie goodness. 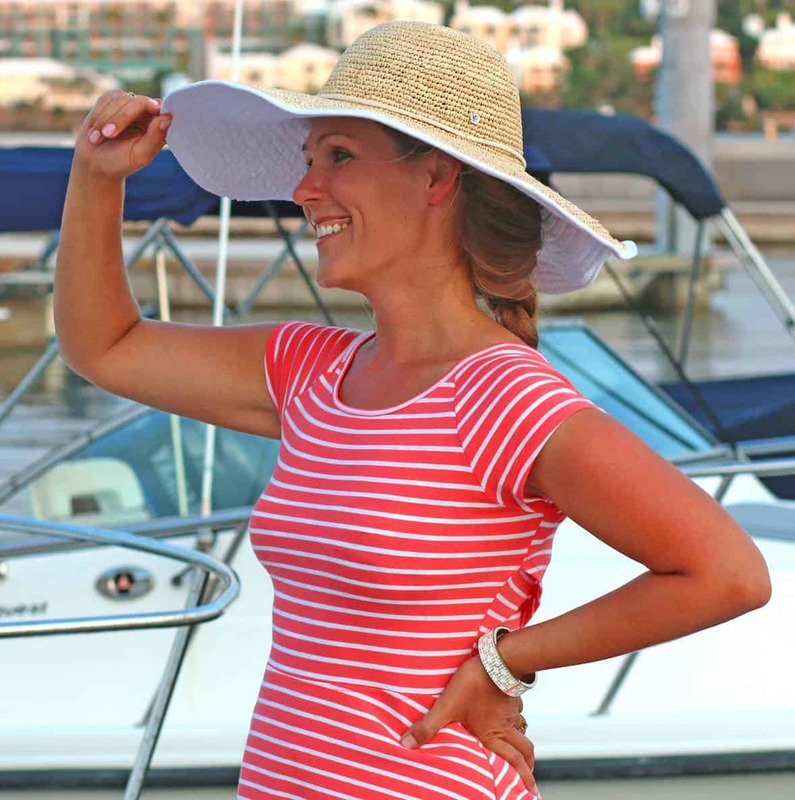 Spring is slowly on its way, yipee! But in most places it’s still beef stew weather. And that’s something to cheer about, too. There’s nothing worse than coming home to hot stew on a sweltering hot day. But when the weather’s cold outside, there are few things more welcoming. 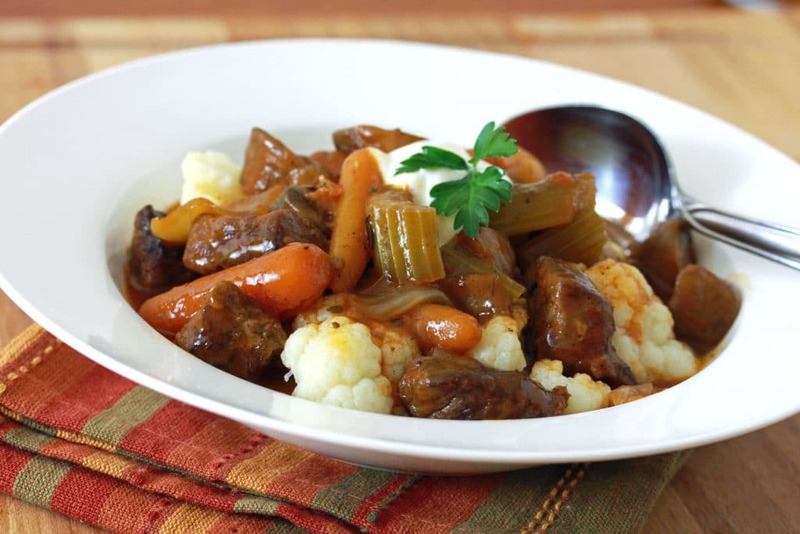 So let’s enjoy the excuse to have some piping hot, comforting beef stew while we can! This stew takes a few extra minutes of prep work than most do because we’re going to brown not only the beef for optimal flavor, we’re also going to brown the onions and carrots, too. 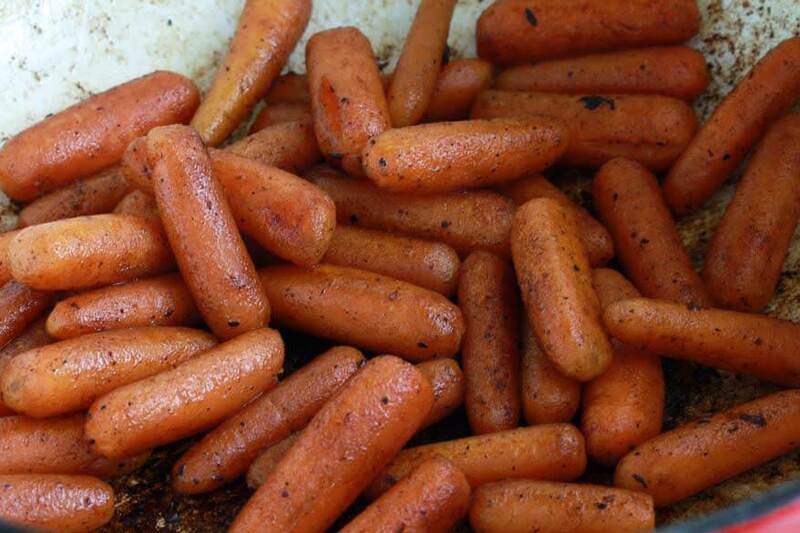 Don’t be impatient and skip this process – it’s key to an amazing flavor. This stew also calls for white instead of traditional red wine, adding some lighter, fruity notes to an otherwise deeply rich flavor. You’re going to love it! And of course you’re more than welcome to add potatoes if you like, or serve the stew over potatoes. Or follow this recipe and put some healthy cauliflower to great use for extra nutrition and a lower carb/calorie meal. 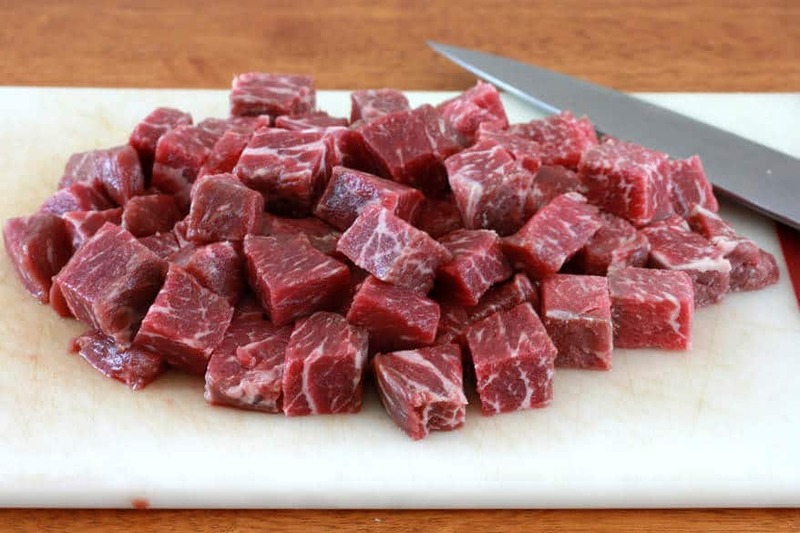 Cut the beef into 3/4 inch cubes. 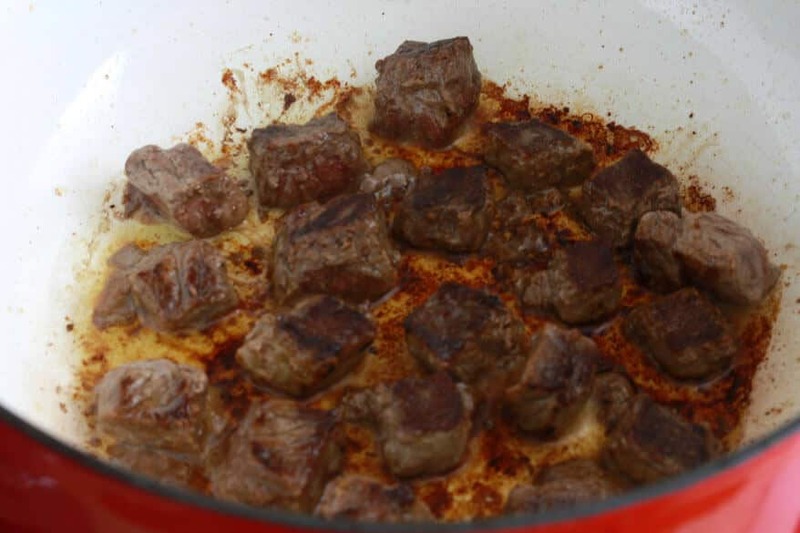 Heat the oil in the Dutch oven and brown the beef on all sides, working batches to avoid over-crowding. 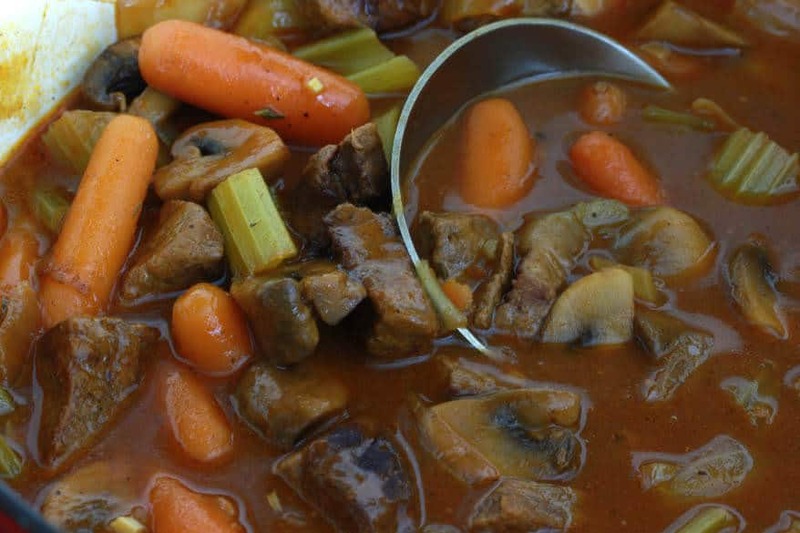 Be generous in the browning – that’s what will give the stew a wonderful flavor. Set the beef aside. 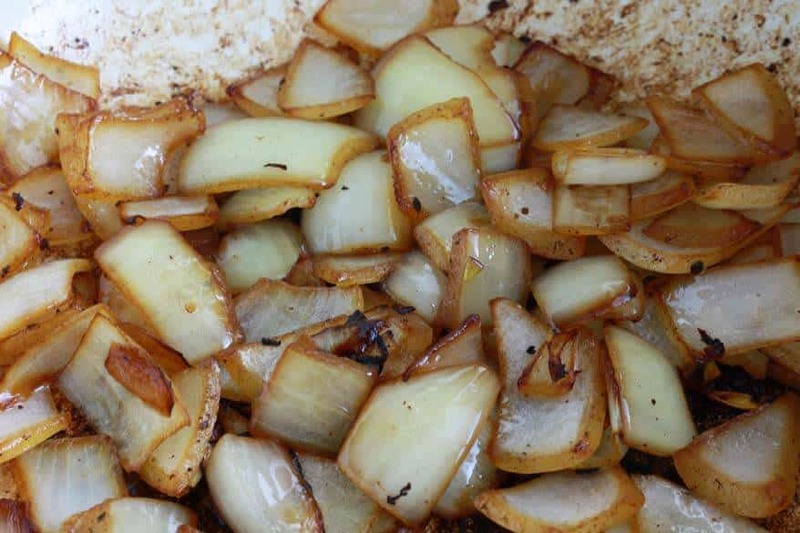 Add the onions and cook until browned and soft, about 5-7 minutes. Transfer to a bowl and set aside. Next brown the baby carrots. Transfer to the onions and set aside. 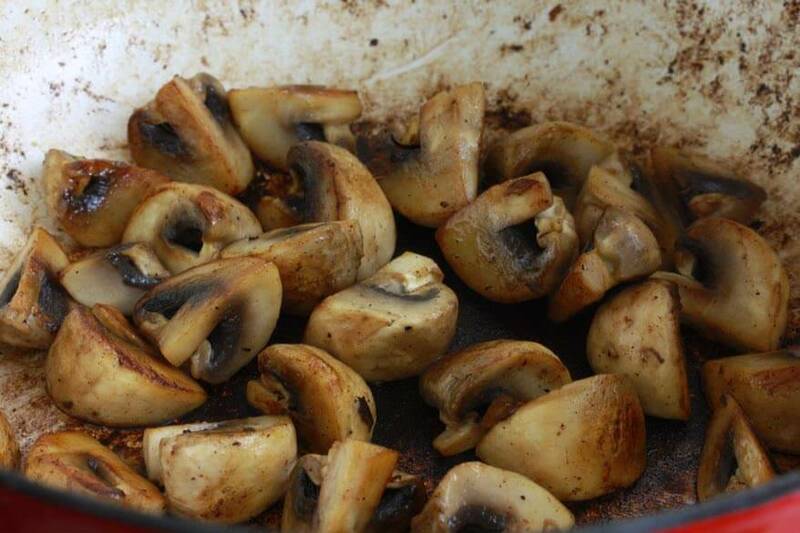 Cook the mushrooms for 2 minutes. Add the white wine, bring to a boil, and simmer for 3-4 minutes or until the wine is reduced by half. Return the beef, onions and carrots to the pot along with the celery, garlic, tomato paste, bay leaves, thyme, pepper and salt. Stir to combine. 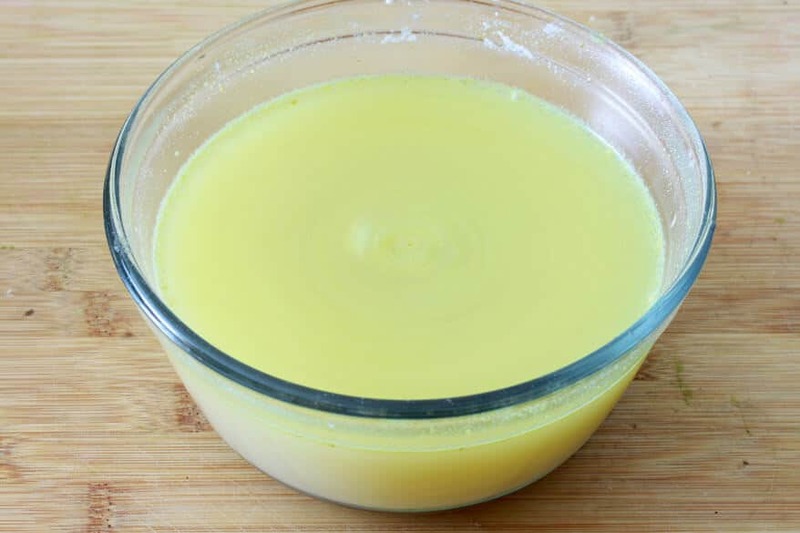 In a large bowl, whisk together the beef stock and the flour until no lumps remain. Add the beef stock mixture to the pot, stirring to combine. 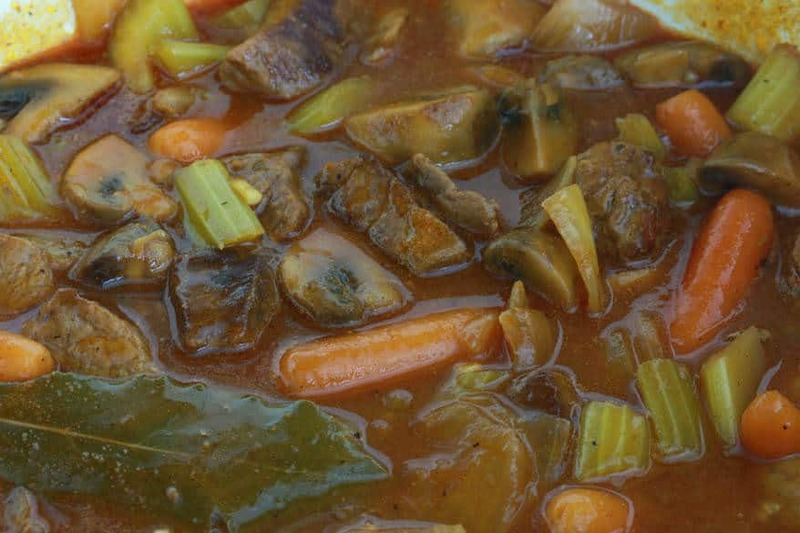 Bring the stew to a boil, reduce the heat to low, cover, and simmer for at least one hour, preferably 2 hours. Divide the cooked cauliflower between the soup bowls and ladle the stew over it. Serve with a dollop of sour cream and a sprig of fresh parsley. Heat the olive oil in a large Dutch oven over medium high heat and sear the beef on all sides until brown, working in batches to prevent over-crowding. 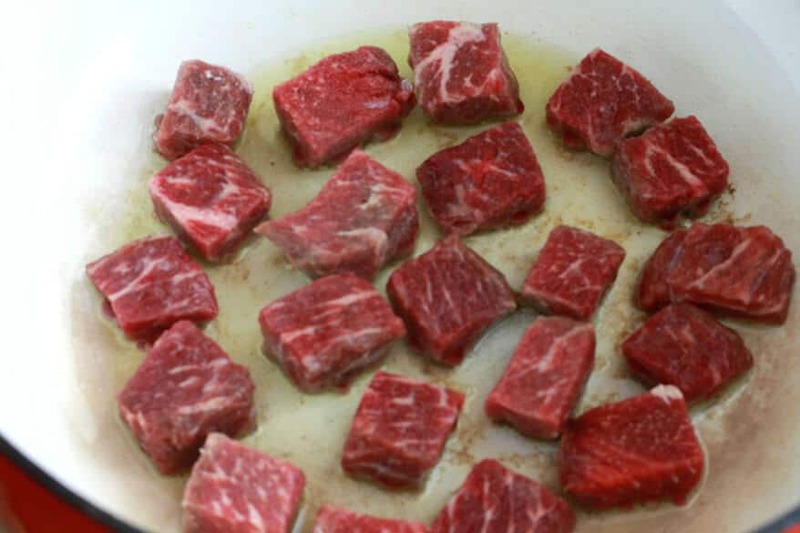 Transfer the beef to a plate and set aside. Add the onions to the Dutch oven and cook until lightly browned, about 5-7 minutes. Transfer to a bowl and set aside. Next brown the carrots, adding more oil if needed. Transfer the carrots to the onions and set aside. 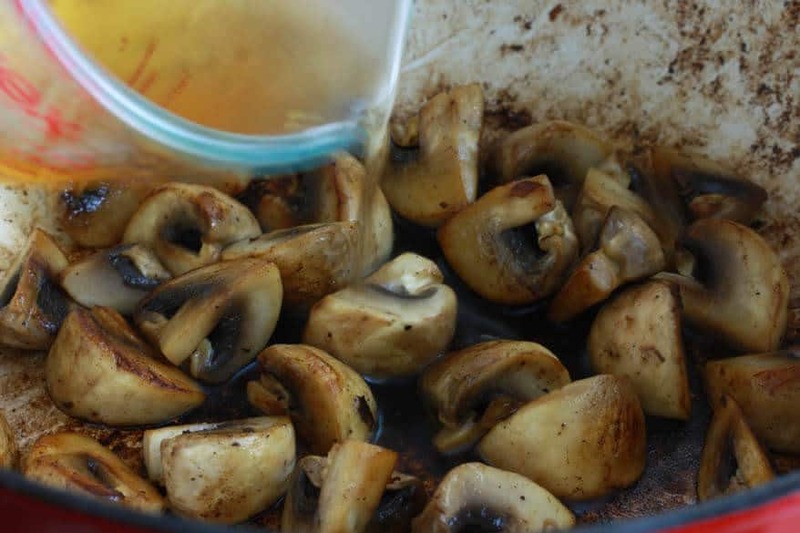 Add the mushrooms and cook for 2 minutes. Add the wine, bring to a boil, reduce to heat and simmer for about 3-4 minutes or until the wine is reduced by half. 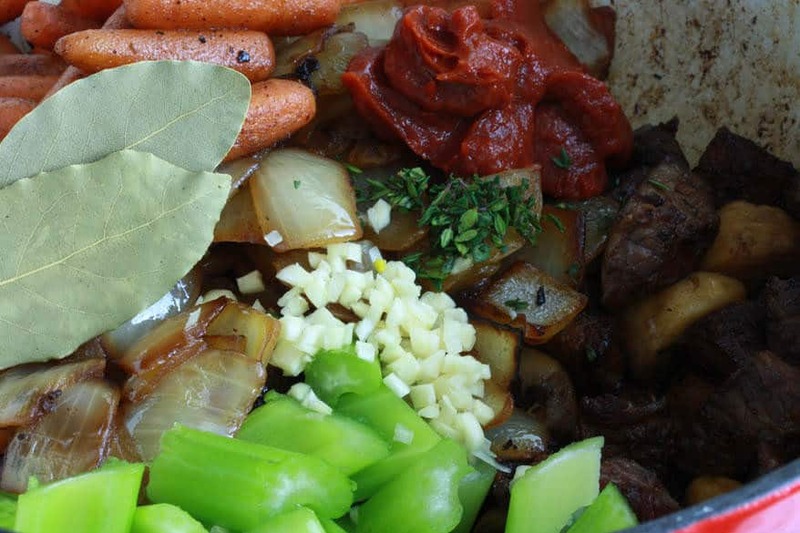 Return the beef to the Dutch oven along with the onions, carrots, celery, garlic, tomato paste, bay leaves, thyme, pepper and salt. Stir to combine. In a bowl, whisk together the beef broth and flour until all the lumps are gone. Add the beef stock mixture to the Dutch oven, stirring to combine. Bring the pot to a boil, reduce the heat to low, cover and simmer for at least one hour, preferably 2 hours. Towards the end of the cooking, boil 4 quarts of water in a large pot and cook the cauliflower florets for 6-8 minutes or until tender. Drain and keep warm until ready to use. Divide the cauliflower between the bowls and ladle the stew over the cauliflower. Serve with a dollop of sour cream and a sprig of fresh parsley.